Carry everything you need for a day of sightseeing with this versatile Vertical Travel Companion from Victorinox&amp#174. Adjustable strap allows the pack to be worn over your shoulder or across your body. Elastic zipper pull covers hold zippers in a closed position for additional security as you tour around and see the sights. Forward zip-away pocket has an organizational panel with stash pockets and key fob. Bag also features an additional front zippered pocket, which is perfect for storing items you need quick access to. Main zippered compartment features a mesh stash pocket for storing smaller, easy-to-lose items. Imported. Measurements: Bottom Width: 7 in Depth: 3 1 2 in Height: 10 in Strap Length: 57 1 2 in Strap Drop: 23 1 2 in Handle Length: 7 in Handle Drop: 2 in Weight: 13 oz Proposition 65 WARNING: This product contains chemicals known to the State of California to cause cancer and birth defects or other reproductive harm. 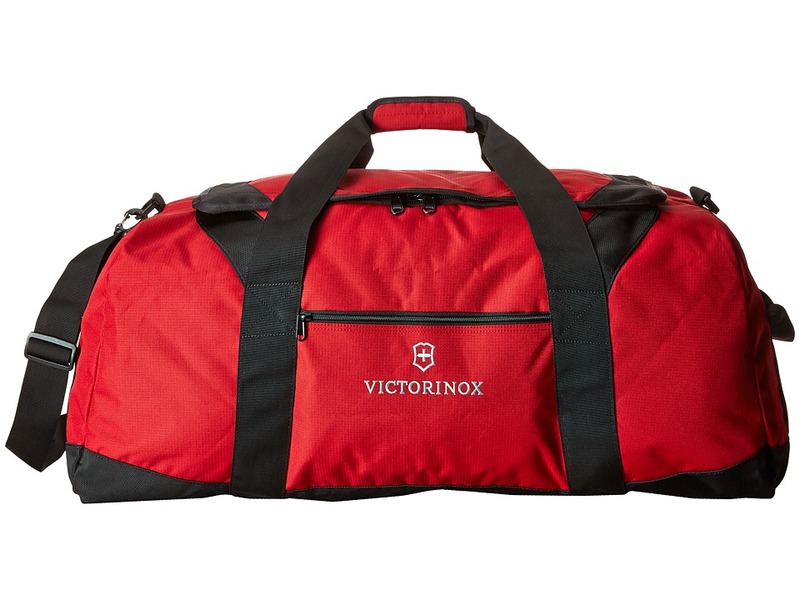 When you~re planning a longer stay, plan to pack with the ease of the Extra-Large Travel Duffel from Victorinox&amp#174. 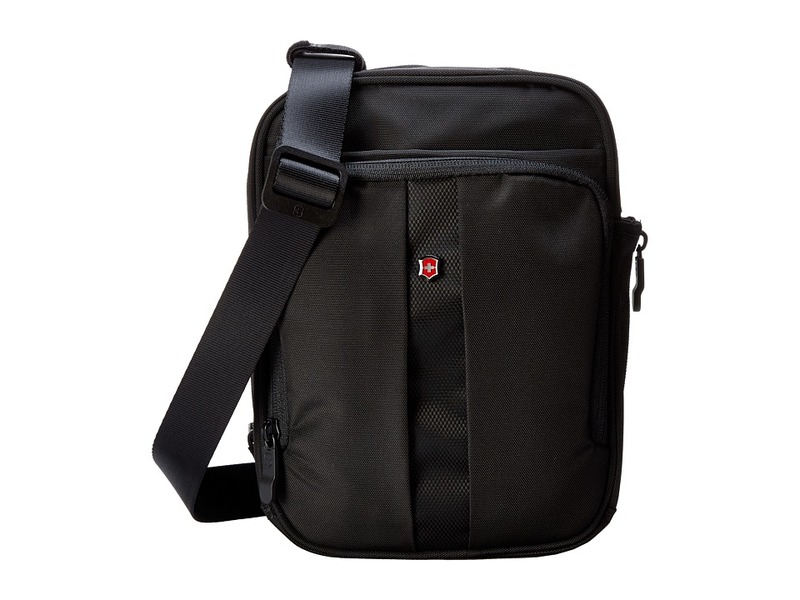 Removable, padded shoulder strap is contoured to comfortably fit the shoulder. Unifying handle wrap snaps together for easy carrying around the crowded airport. Front zippered pocket features with internal zippered mesh pocket to store loose change. Large u-shaped main compartment unzips to showcase a roomy interior that is lined to protect your valuables. YKK Racquet Coil zippers provide smooth zipper action and extraordinary burst strength. Imported. Measurements: Bottom Width: 36 in Depth: 15 in Height: 14 in Strap Length: 30 1 2 in Strap Drop: 9 in Handle Length: 9 1 2 in Handle Drop: 3 in Accessory Strap Length: 57 in Accessory Strap Drop: 27 1 2 in Weight: 2 lbs 11 oz Proposition 65 WARNING: This product contains chemicals known to the State of California to cause cancer and birth defects or other reproductive harm. When last-minute plans are thrown your way, you need the pick-up-and-go style of the Victorinox Packable Backpack. Constructed from durable nylon. Adjustable shoulder straps with top-carrying handle for easy transport. Front exterior zip pocket is perfect for storing small essentials. Zippered main compartment is spacious for all of your belongings. Folds to a compact size for easy storage and transport. Attaches with an exterior loop to other pieces of luggage. Imported. Measurements: Bottom Width: 10 in Depth: 6 in Height: 17 in Strap Length: 33 1 2 in Strap Drop: 15 in Handle Length: 8 in Handle Drop: 2 1 2 in Weight: 9 oz Proposition 65 WARNING: This product contains chemicals known to the State of California to cause cancer and birth defects or other reproductive harm. When last-minute plans are thrown your way, you need the pick-up-and-go style of the Victorinox Packable Day Bag. Constructed from durable nylon. Two handles for easy transport. Front exterior zip pocket is perfect for storing small essentials. Zippered main compartment is spacious for all of your belongings. Folds to a compact size for easy storage and transport. Imported. Measurements: Bottom Width: 17 in Depth: 6 in Height: 11 1 2 in Strap Length: 24 in Strap Drop: 11 in Weight: 8 oz Proposition 65 WARNING: This product contains chemicals known to the State of California to cause cancer and birth defects or other reproductive harm. Easily identify your bag and keep its contents secure wherever you travel with the Victorinox&amp#174 Travel Sentry&amp#8482 TSA Approved Lockable Luggage Strap. Travel Sentry&amp#8482 Approved lock secures belongings while in transit and allows TSA to unlock and lock the strap without destroying it for inspection. 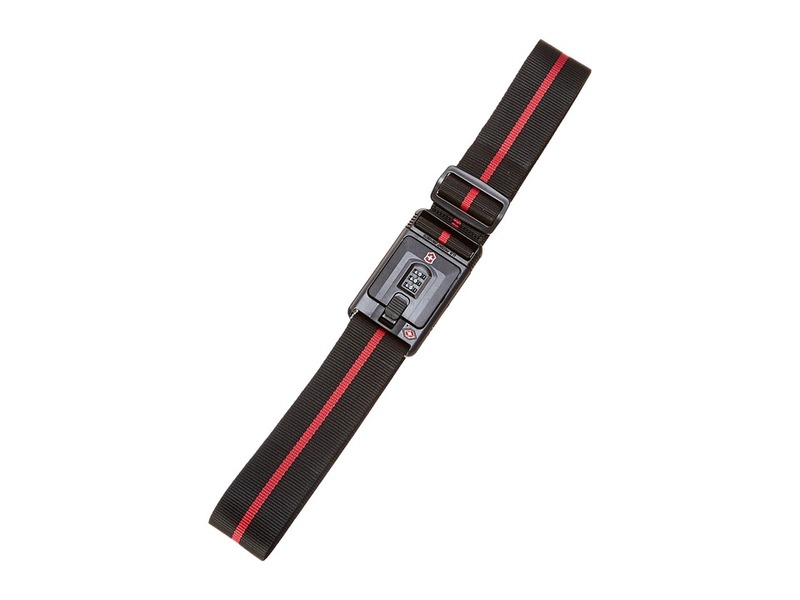 Quick-release buckle closure with durable, webbing strap can be adjusted to fit up to a 30 bag. 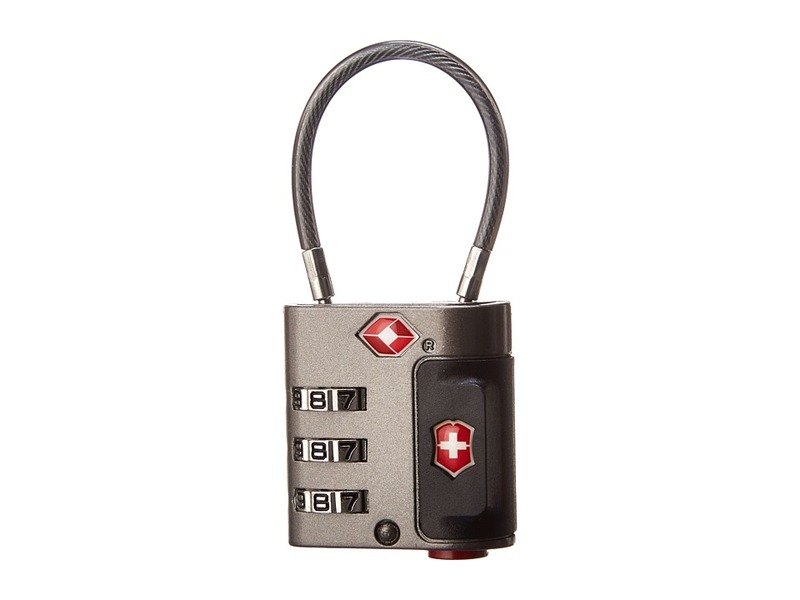 Three-digit combination lock can be reset as often as needed to ensure optimal security. Dimensions: 5.0 wide x 2.0 deep x 22.0 length. Weight: 5.0 oz. Imported. Measurements: Strap Length: 71 in Proposition 65 WARNING: This product contains chemicals known to the State of California to cause cancer and birth defects or other reproductive harm. 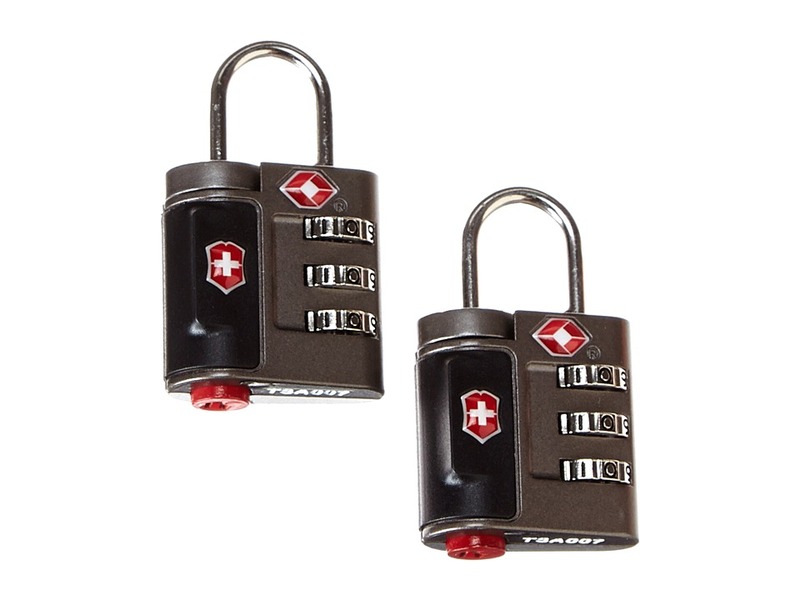 Keep your valuable items safe and secure with the Victorinox&amp#174 Travel Sentry&amp#8482 TSA Approved Lock Set. Durable cast zinc construction is built tough to withstand repeated used and rough travels. Travel Sentry&amp#8482 Approved lock secures belongings together while in transit and allows TSA to unlock and lock the strap without destroying it for inspection. Metal hoops are designed to fit through most lockable zipper sliders on luggage and briefcases. Three-digit combination lock can be reset as often as needed to ensure optimal security. Individual dimensions: 1.3 wide x 0.8 deep x 2.5 high. Imported. Measurements: Bottom Width: 1 1 4 in Depth: 1 2 in Height: 2 1 4 in Weight: 2 oz Proposition 65 WARNING: This product contains chemicals known to the State of California to cause cancer and birth defects or other reproductive harm. Keep your valuable items safe and secure with the Victorinox&amp#174 Travel Sentry&amp#8482 Approved Cable Lock. Durable cast zinc construction is built tough to withstand repeated used and rough travels. Travel Sentry&amp#8482 Approved lock secures belongings together while in transit and allows TSA to unlock and lock the strap without destroying it for inspection. Metal hoops are designed to fit through most lockable zipper sliders on luggage and briefcases. Three-digit combination lock can be reset as often as needed to ensure optimal security. 1.3 in wide x 0.8 in deep x 2.5 in high. Imported. Measurements: Bottom Width: 1 1 4 in Depth: 1 2 in Height: 3 in Weight: 2.3 oz Proposition 65 WARNING: This product contains chemicals known to the State of California to cause cancer and birth defects or other reproductive harm. Keep all of your important travel documents organized for a worry-free trip. Constructed of durable ballistic nylon. Durable zipper closure. Interior features zippered mesh pocket, large storage pocket, ID slot, and a full-length zippered pocket. RFID protection technology safeguards personal data stored on RFID microchips in passport, credit cards and ID cards. Features an exterior slash pocket for convenient storage of receipts. Imported. Measurements: Bottom Width: 5 1 2 in Depth: 1 1 4 in Height: 10 1 4 in Handle Length: 4 1 2 in Handle Drop: 2 1 4 in Weight: 8 oz Proposition 65 WARNING: This product contains chemicals known to the State of California to cause cancer and birth defects or other reproductive harm. Please check with your airline for carry-on luggage size restrictions. 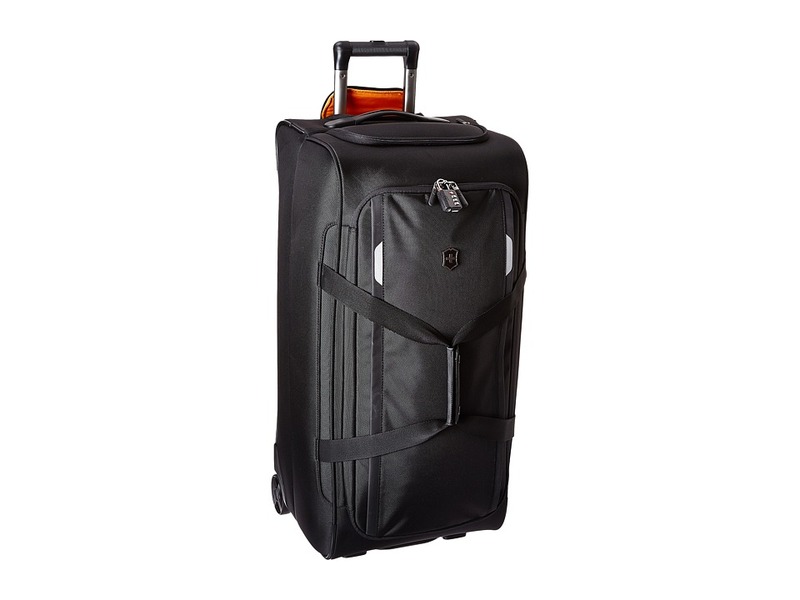 The Werks Traveler 5.0 - WT 20 Expandable Wheeled Global Carry-On is ideal for keeping your essentials close at hand. Front pocket can hold up to a 17 laptop. Comfort grip, one-touch, dual-trolley aluminum handle system adjusts at the push of a button and locks into three different positions - 41, 39, and 37 - to accommodate travelers of various heights and travel needs. ID tray slides into handle bezel. Bag expands an additional 2.5. Removable attach-a-bag strap secures an additional bag to the front of the upright and holds up to 30 lbs. Travel Sentry&amp#174 Approved combination lock secures belongings. Access Lock Combination Recovery Program allows you to register your lock combination and recover it if it is ever forgotten. Lockable YKK Racquet Coil zippers have superior strength. Interior Pack More System features the Pack More divider, mesh pockets, X-shaped compression straps, and removable suiter. Rear skid plate protects the bag from abrasion as you traverse through the airport and city streets. Features 80mm inline skate wheels. Imported. Measurements: Width: 14 in Depth: 9 in Height: 20 in Weight: 8 oz Proposition 65 WARNING: This product contains chemicals known to the State of California to cause cancer and birth defects or other reproductive harm. 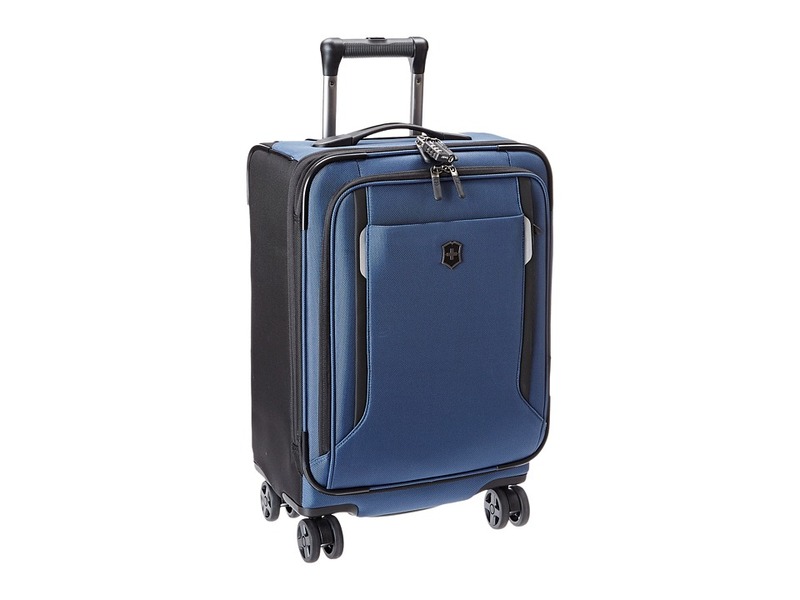 The Werks Traveler 5.0 - WT 22 Expandable Wheeled Carry-On is perfect for those long weekend getaways. 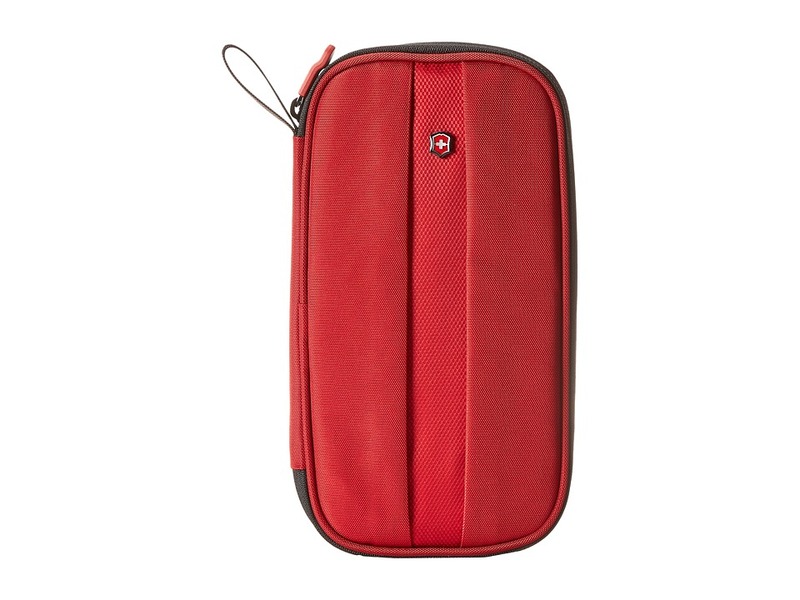 U-shaped front pocket can accommodate up to a 17 laptop. Comfort grip, one-touch, dual-trolley aluminum handle system adjusts at the push of a button and locks into three different positions - 41, 39, and 37 - to accommodate travelers of various heights and travel needs. ID tray slides into handle bezel for security and convenience. Bag expands an additional 2.5. Removable attach-a-bag strap secures an additional bag to the front of the upright and holds up to 30 lbs. Travel Sentry&amp#174 Approved combination lock secures belongings and allows U.S. airport security screeners to open the lock without destroying it and relock it after inspection. Access Lock Combination Recovery Program allows you to register your lock combination and recover it if it is ever forgotten. Lockable YKK Racquet Coil zippers have superior strength. Interior Pack More System features the Pack More divider, mesh pockets, X-shaped compression straps, and removable suiter. Rear skid plate protects the bag from abrasion as you traverse through the airport and city streets. Features 80mm inline skate wheels for a smooth and stable roll. Imported. Measurements: Width: 14 in Depth: 9 in Height: 22 in Weight: 8 lbs Proposition 65 WARNING: This product contains chemicals known to the State of California to cause cancer and birth defects or other reproductive harm. 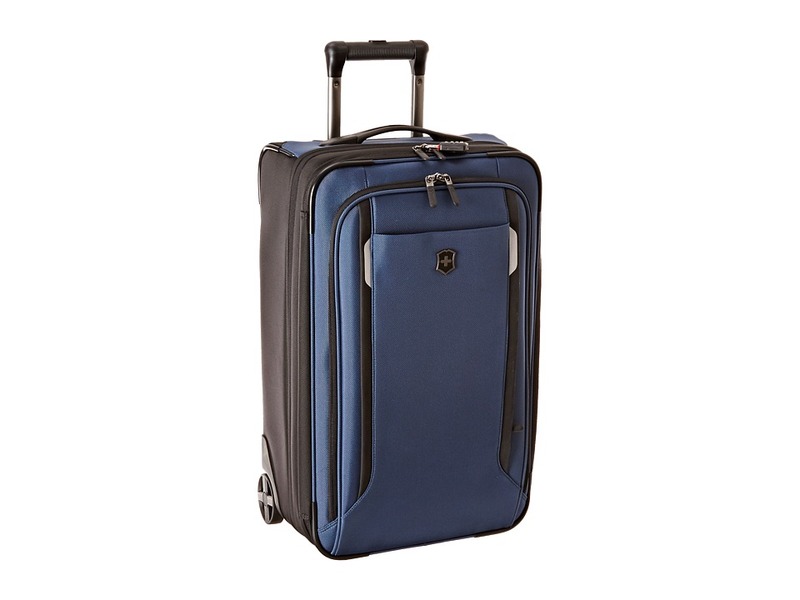 Travel with confidence using the Werks Traveler 5.0 - WT 20 Dual Caster Expandable 8-Wheel Global Carry-On. 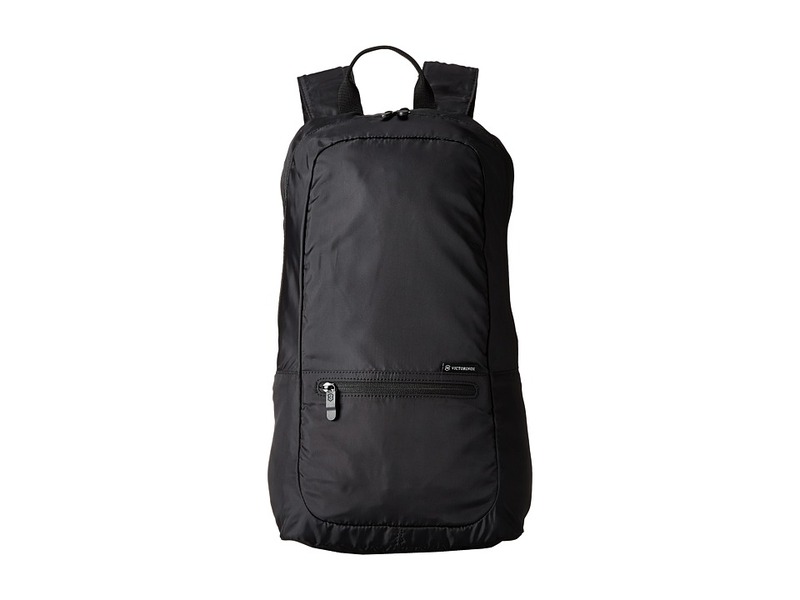 U-shaped front pocket can accommodate up to a 15.6 laptop. Comfort grip, one-touch, dual-trolley aluminum handle system adjusts at the push of a button and locks into three different positions - 41, 39, and 37 - to accommodate travelers of various heights and travel needs. ID tray slides into handle bezel for security and convenience. Bag expands an additional 2. Removable attach-a-bag strap secures an additional bag to the front of the upright and holds up to 30 lbs. Travel Sentry&amp#174 Approved combination lock secures belongings and allows U.S. airport security screeners to open the lock without destroying it and relock it after inspection. Access Lock Combination Recovery Program allows you to register your lock combination and recover it if it is ever forgotten. Lockable YKK Racquet Coil zippers have superior strength. Interior Pack More System features the Pack More divider, mesh pockets, and X-shaped compression straps. Rear skid plate protects the bag from abrasion as you traverse through the airport and city streets. Dual-caster construction adds stability and provides 360&amp#176 movement with zero weight in hand. Imported. Measurements: Depth: 9 in Height: 20 1 2 in Weight: 7 lbs Proposition 65 WARNING: This product contains chemicals known to the State of California to cause cancer and birth defects or other reproductive harm. 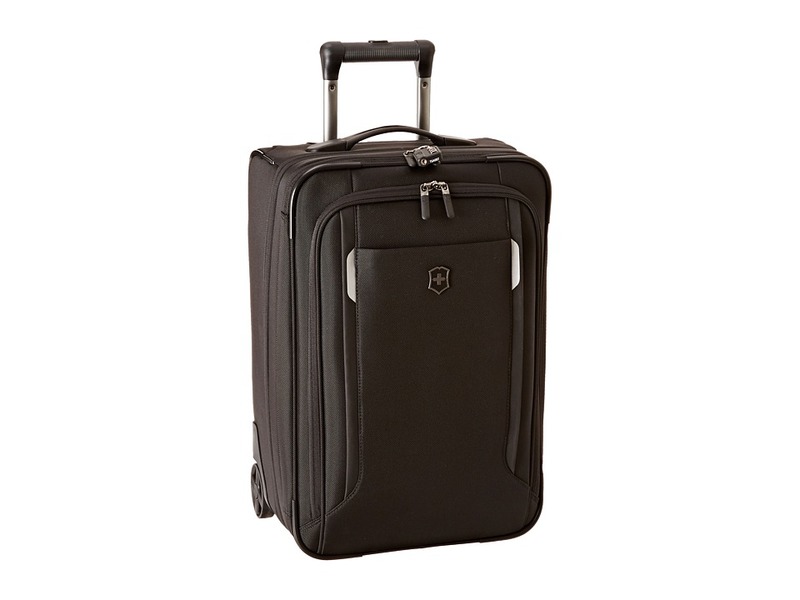 Simplify packing for your next trip with the Werks Traveler 5.0 - WT 22 Dual Caster Expandable 8-Wheel U.S. Carry-On. Comfort grip, one-touch, dual-trolley aluminum handle system adjusts at the push of a button and locks into three different positions - 41, 39, and 37 - to accommodate travelers of various heights and travel needs. ID tray slides into handle bezel for security and convenience. U-shaped front pocket holds up to a 17 (43 cm) laptop. Bag expands 2. 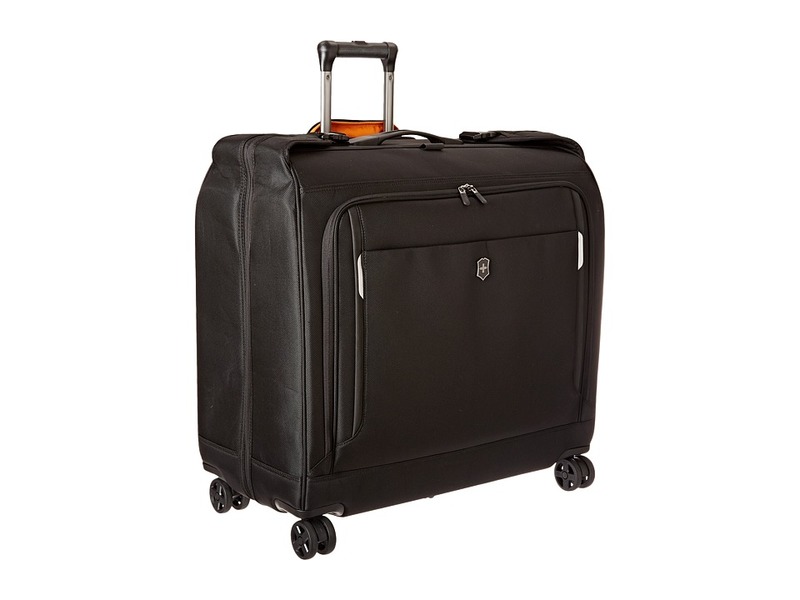 This case measures as 24 tall including the wheels and handle. Removable attach-a-bag strap secures an additional bag to the front of the upright and holds up to 30 lbs. Travel Sentry&amp#174 Approved combination lock secures belongings and allows U.S. airport security screeners to open the lock without destroying it and relock it after inspection. Access Lock Combination Recovery Program allows you to register your lock combination and recover it if it is ever forgotten. Lockable YKK Racquet Coil zippers have superior strength. Interior Pack More System features the Pack More divider, mesh pockets, X-shaped compression straps, and removable suuiter. Rear skid plate protects the bag from abrasion as you traverse through the airport and city streets. Dual-caster construction adds stability and provides 360&amp#176 movement with zero weight in hand. Imported. Measurements: Width: 14 in Depth: 9 in Height: 22 in Weight: 8 lbs Proposition 65 WARNING: This product contains chemicals known to the State of California to cause cancer and birth defects or other reproductive harm. Whether you~re headed to the gym or taking a short weekend trip, the Victorinox Werks Traveler 5.0 - WT Weekender has you covered. Spacious carry-all bag made of durable fabric. Molded top carry handles. Removable, adjustable padded shoulder strap. Rear pocket converts to a sleeve for sliding over the handle system of wheeled luggage. Zippered 5 drop down expansion for additional storage room when needed. Top zipper closure. Lined interior features a back wall zip pocket. Imported. Measurements: Width: 12 in Depth: 8 in Height: 18 1 2 in Weight: 4 lbs Proposition 65 WARNING: This product contains chemicals known to the State of California to cause cancer and birth defects or other reproductive harm. 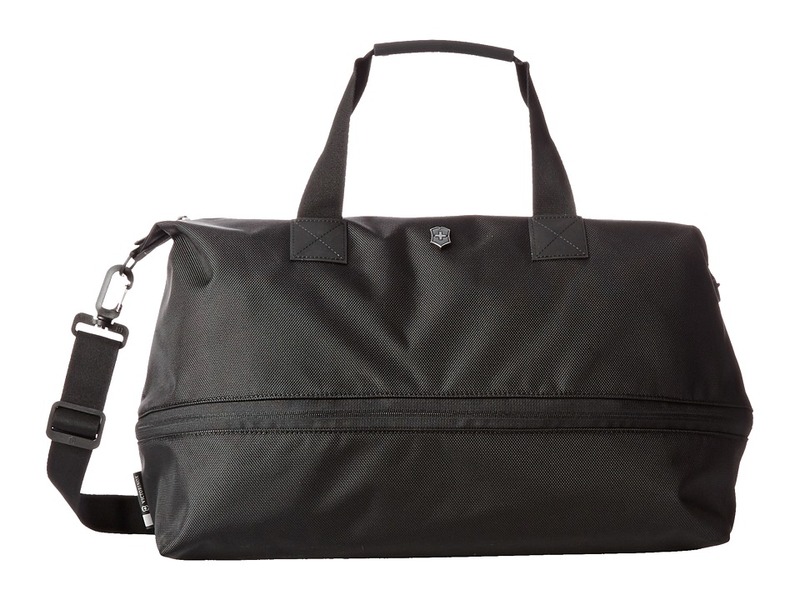 The Victorinox Werks Traveler 5.0 - WT Duffel is both sporty and functional. 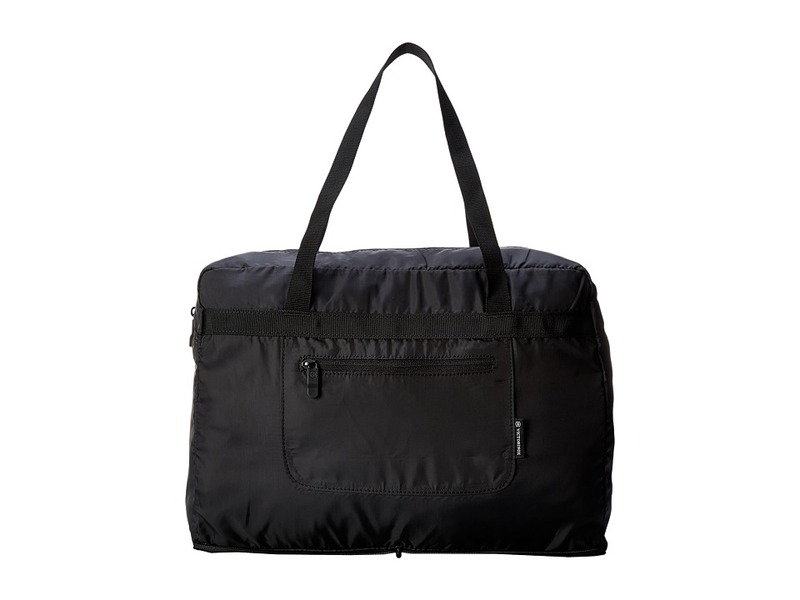 Multi-purpose duffel bag with a spacious interior and organizational pockets. Molded haul handles. Removable, adjustable, padded shoulder strap. 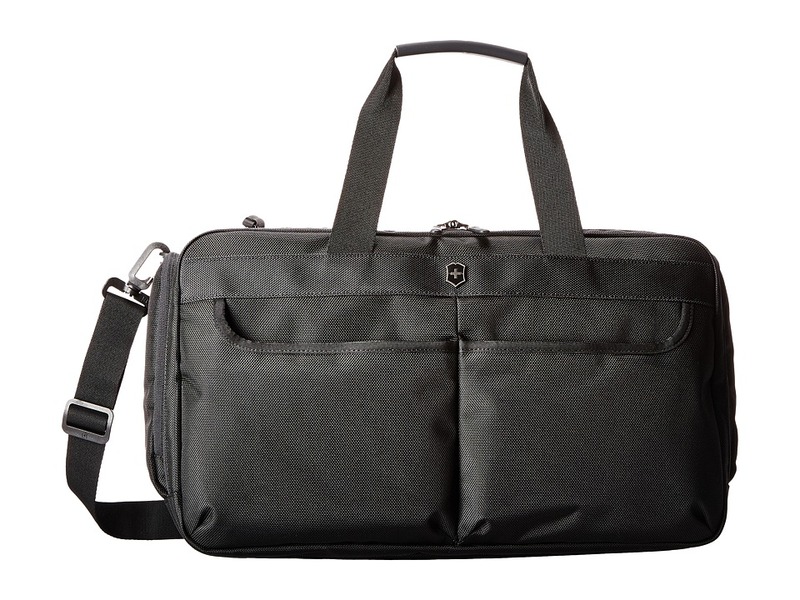 Front organizational panel includes padded protection for up to a 15.6 laptop, three padded electronics pockets sized to hold a tablet or eReader, two mesh peripherals pockets, and a key fob. Rear pocket converts to a sleeve for sliding over the handle system of wheeled luggage. Dual-zip top opening provides easy access to the spacious main compartment. Interior features two padded electronics pockets sized to hold an iPad or eReader, two mesh peripherals pockets, and a full-length zippered lining pocket. Imported. Measurements: Bottom Width: 19 in Middle Width: 19 in Top Width: 19 in Depth: 7 in Height: 12 in Strap Length: 54 in Strap Drop: 24 in Handle Length: 20 in Handle Drop: 7 in Weight: 2 lbs 14.4 oz Proposition 65 WARNING: This product contains chemicals known to the State of California to cause cancer and birth defects or other reproductive harm. The Werks Traveler 5.0 - WT Wheeled Duffel offers convenient packing for those longer adventures. Comfort grip, dual-trolley handle system for superior control. Integrated ID tray for security and convenience. Molded haul handles with unifying wrap. Exterior features two zippered top quick-access pockets and a zippered side pocket to separate shoes or other items from main compartment. Travel Sentry&amp#174 Approved combination lock secures belongings and allows U.S. airport security screeners to open the lock without destroying it and relock it after inspection. Access Lock Combination Recovery Program allows you to register your lock combination and recover it if it is ever forgotten. Lockable YKK Racquet Coil zippers have superior strength. Interior Pack More System features the Pack More divider, mesh pockets, X-shaped compression straps, and removable suiter. Features 80mm inline skate wheels for a smooth and stable roll. Imported. Measurements: Bottom Width: 13 in Middle Width: 13 in Top Width: 13 in Depth: 14 in Extended Depth: 16 in Height: 31 in Strap Length: 24 in Strap Drop: 9 in Handle Length: 13 in Handle Drop: 1 in Accessory Strap Length: 23 in Accessory Strap Drop: 8 in Weight: 9 lbs Proposition 65 WARNING: This product contains chemicals known to the State of California to cause cancer and birth defects or other reproductive harm. 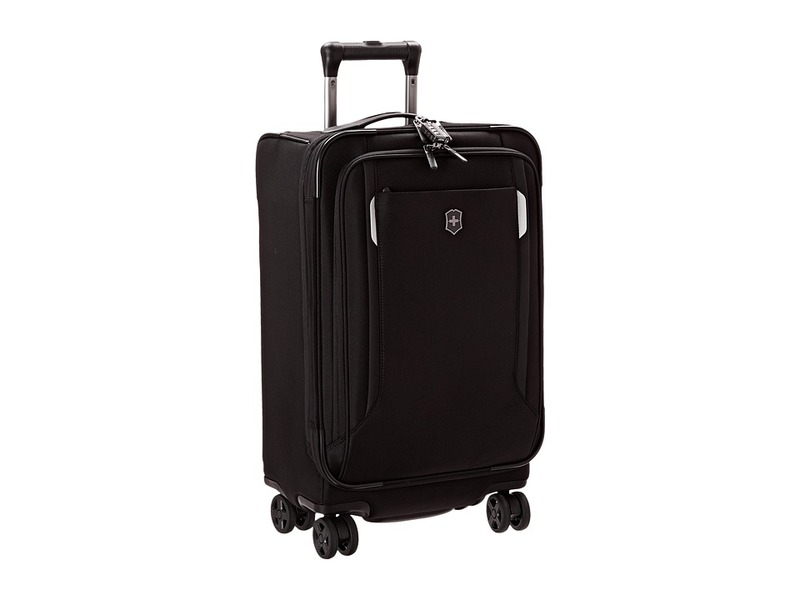 The Victorinox Werks Traveler&amp#8482 5.0 - WT East/West Wheeled Garment Bag lays flat for easy packing and helps keep clothes wrinkle-free during travel. Comfort grip, dual-trolley handle system for superior control. Integrated ID tray for security and convenience. Large front zippered pocket is ideal for accessories. Main zippered compartment features a roomy interior that is fully lined to protect your valuables. Organizing features such as a tie pocket, two removable mesh corner storage pockets and a zippered mesh shoe pocket. Hangar clamp secures garments while foam bolster compression straps minimize wrinkles. Detachable J-hook for hanging over a door or in a closet. Travel Sentry&amp#174 Approved luggage lock secures belongings. Access Lock Combination Recovery Program allows you to register your lock combination and recover it if it is ever forgotten. Lockable YKK Racquet Coil zippers have superior strength. Rear skid plate protects the bag from abrasion. 80mm inline skate wheels for a smooth and stable roll. Imported. Measurements: Bottom Width: 22 in Middle Width: 22 in Top Width: 22 in Depth: 9 in Extended Depth: 9 in Height: 41 in Handle Length: 9 in Handle Drop: 1 in Weight: 9 lbs Proposition 65 WARNING: This product contains chemicals known to the State of California to cause cancer and birth defects or other reproductive harm. 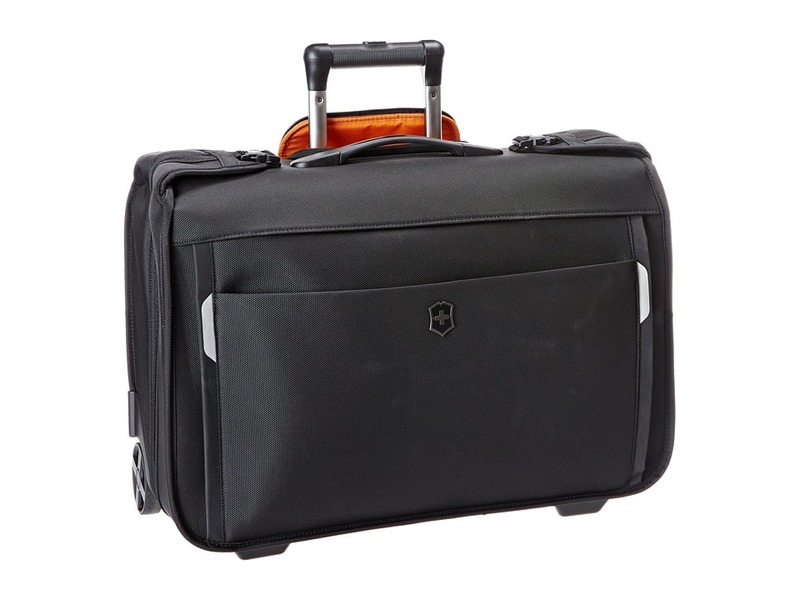 The Victorinox Werks Traveler&amp#8482 5.0 - WT Dual Caster Garment Bag is ideal for multi-day business trips. Comfort grip, dual-trolley handle system for superior control. Integrated ID tray for security and convenience. Two large front exterior zippered pockets for storing accessories. Interior features a tricot-lined tie pocket, organizational pockets, two removable mesh storage cubes, and a detachable J-hook for hanging. Hanger clamp secures garments and foam bolster compression strap helps minimize wrinkles. Removable attach-a-bag strap secures an additional bag to the front of the garment bag and holds up to 30 lbs. Travel Sentry&amp#174 Approved luggage lock secures belongings and allows U.S. airport security screeners to open the lock without destroying it and relock it after inspection. Access Lock Combination Recovery Program allows you to register your lock combination and recover it if it is ever forgotten. Lockable YKK Racquet Coil zippers have superior strength. Dual casters deliver a smooth, stable, quiet roll and provide 360&amp#176 movement with zero weight in hand. Imported. Measurements: Bottom Width: 24 in Middle Width: 24 in Top Width: 24 in Depth: 12 in Height: 23 in Weight: 14 lbs Proposition 65 WARNING: This product contains chemicals known to the State of California to cause cancer and birth defects or other reproductive harm. 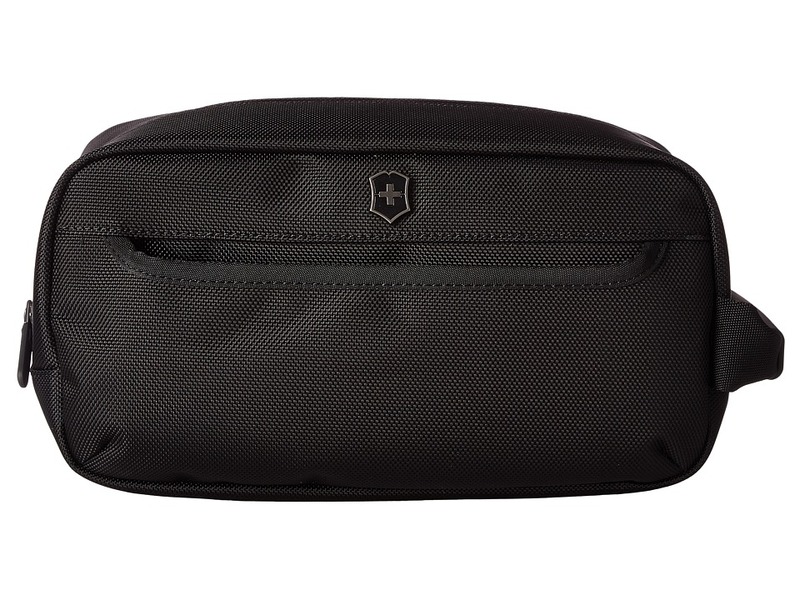 Keep your essentials neatly stored in the Victorinox Werks Traveler 5.0 - WT Toiletry Kit. Zipper travel case made of polyethylene with easy-to-clean lining. Molded haul handle. Front zippered pocket for small items. YKK Racquet Coil zippers. Spacious interior features two padded storage pockets. Imported. Measurements: Bottom Width: 11 1 2 in Middle Width: 11 1 2 in Top Width: 11 1 2 in Depth: 5 in Height: 6 1 2 in Handle Length: 8 in Handle Drop: 1 in Weight: 7.7 oz Proposition 65 WARNING: This product contains chemicals known to the State of California to cause cancer and birth defects or other reproductive harm.